Nineteen year old Leslassa Armour-Shillingford is the new Miss Dominica. Winning four of nine categories at the Carnival Queen pageant at Carnival City in Potterville on Friday night, Leslassa decimated her six other contenders to secure the prestigious title. "I worked hard, I knew that I had had done well but did not really expect to reach thus far," she told the press a few minutes after she was crowned by Miss Dominica 2012, Nadira Lando. "I want to represent Dominica in the best way possible when I get this chance. It was a tough competition and I will continue on the same platform that I started." Performing at number six in a completion dubbed "Triumph of Elegance" by the organisers, Leslassa appeared on stage as a black capped petrel seeking refuge in the crevices of Dominica's majestic mountains. The beauty from Loubiere in New Town named her talent piece "I am Dominica's National Park." Using Diablotin, the bird, she said: "I am hunted day and night by those who call me Diablotin"; she wants the bird to be protected from extinction. Though inspiring, her theme was not surprising. Sponsored by her employer, Anchorage Hotel Whale Watch and Dive Centre, Leslassa has always been passionate about conservation and living in balance with nature. Her pageant platform is holistic education. Her motto is: find your passion and excel. Indeed she excelled. The pageant judges gave four major awards: Best Costume; Best Performing Talent; Best Swimwear; and Best in Swimwear. Again using her "nature" theme in the swimwear round, Leslassa said: "Dominica's rivers and waterfalls pay homage to our roots, land and people". The swimwear was designed by Carla Armour and constructed by Philina Sango. 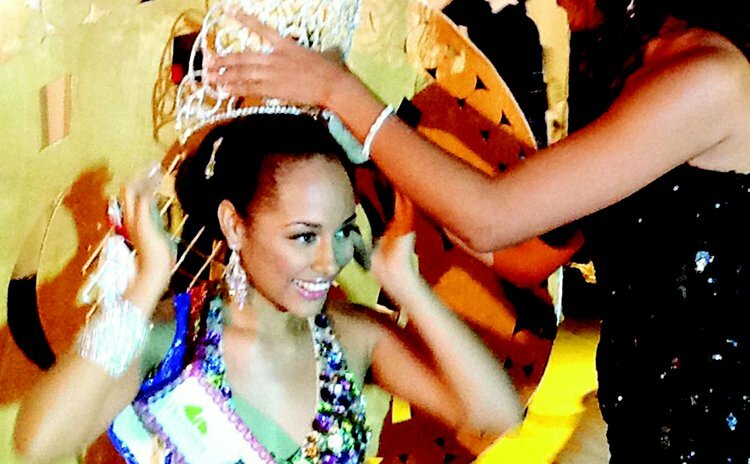 The eventual Miss Dominica replicated her theme in the evening wear round that she described as a "celebration of the Soufriere and Scottshead Marine Reserve"; she appeared as Poseidon's Bride. As usual, the contestants underwhelmed in the question and answer section of the pageant; in fact a commentator said the competitors fell "woefully" short; they either did not answer the question posed or simple made "a passing comment." Nickisha Philbert, according to the judges, won that round and was given the Best Response to Questions Award. First Runner-up Kelshia Breezie appeared in a costume depicting the wings of a Humming Bird which was conceptualized and built by Danley Guye, one of Dominica's best costume designers. She won the Best in Costume award and was also named Miss Amity. For the evening wear round, she wore a strip of gold material that accentuated her waistline. However, it was Second Runner-up Daina Matthew who won the Best Evening Wear and Best in Evening Wear Awards. In the costume round Daina appeared "as creative dynamix" in a costume designed by Amy Polypore and built by Creative Dynamix and friends.